A U.S.-China Trade war undoubtedly presents opportunities for India's job-led manufacturing sector, but a conducive policy environment and synchronized U.S.-India agenda will determine the likelihood of these opportunities. The aftermath of the U.S.-China trade war could lead to deeper trade ties between India and the U.S. In his speech on October 4 outlining the Administration's Policy Towards China, Vice President Pence said, "to advance our vision of a free and open Indo-Pacific, we're building new and stronger bonds with nations that share our values across the region, from India to Samoa." A U.S.-China trade war undoubtedly presents opportunities for India's job-led manufacturing sector, but a conducive policy environment and synchronized U.S.-India agenda will determine the likelihood of these opportunities. Both the U.S. Administration, as expressed by Vice President Pence, and the U.S. giants in China, are turning to competitive markets, with India as an obvious alternative. By now, most U.S. businesses are aware of India's lucrative prospects as the fastest growing economy, expanding consumption patterns, and increasing integration into the global economy. And as India aspires to become Asia's biggest manufacturing hub, additional investments and modern technology from foreign countries will help create jobs for its enormous workforce. The need for investment makes it relevant for India to showcase its competitive advantages and to send positive signals to prospective investors. Foreign investors are well-aware of India's limited bandwidth to undertake major structural reforms in the impending election year; but a few policy quick-fixes can reassure India's commitment to welcoming FDI and boosting the confidence of investors who are eager to shift or expand their manufacturing facilities to India. Businesses elect for markets offering incentives, and Indian states have the ability to proactively offer competitive packages with tax incentives. In addition to domestic selling, China-focused U.S. companies are also engaged in imports and exports, which will now become costlier, due to additional tariffs in the midst of the ongoing trade war. The U.S. business interests in China will be hit heavily with increased costs of their procurement from the U.S. due to hiked tariffs by China. The U.S. suppliers may not find orders matching those from China, but they will diversify their exports to a third country with comparatively lower tariffs. According to the PoliticoPro secondary data based on USTR's USA Trade database and U.S. Census Bureau figures, the U.S. has imposed 10-percent additional duties on about $200 billion worth of Chinese goods effective September 24 , with the majority impacting chemical products, capital goods and aircrafts. 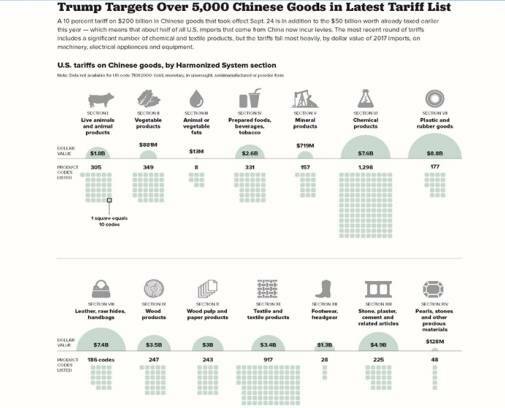 According to the Chinese Ministry of Commerce, USA Trade database, and U.S. Census Bureau, USITC, China has retaliated by slapping 5-10 percent additional tariffs on $60 billion worth of U.S. products, most notably mineral and chemical products, plastic and rubber products, and mechanical and electrical machinery. India should be an obvious choice for U.S. suppliers who produce mineral, chemical and allied products; capital goods like machinery, mechanical, and electrical equipment; and vehicles and aircrafts as industrial activity is rising in India. With a huge base of livestock, India could also present opportunities to U.S. soymeal suppliers. India can enhance its exports of agricultural items, leather, rubber goods, base metal and machinery, textiles and chemical products, including pharmaceuticals, to the U.S.
Sector-specific analysis must be done to assess where India can be a competitive supplier and purchaser for businesses both in the U.S. and China. This strategy will help address trade deficit concerns between the U.S. and India, as well as between India and China. However, it may require the respective governments to focus heavily on tariff barriers in these sectors through bilateral negotiations. Prime Minister Modi's "Make in India" campaign provides a strong pitch for India's restructuring of its manufacturing economy and its standard of living, while simultaneously creating jobs through increased investment, innovation, enhanced skills, strong intellectual property protection, and world-class infrastructure. According to Deloitte's Global Manufacturing Competitiveness study, the manufacturing sector in India may create 90 million new jobs by 2025 with high growth rates in electronics, industrial manufacturing, transport and logistics, chemicals, and real estate. Large multinational companies have expressed confidence in India's potential in manufacturing, but if India wants to optimize its manufacturing sector through new investments and technologies, it becomes extremely important for the government to provide a conducive soft and hard infrastructure in which international businesses can start their operations without delays. India will need to step up its pace of regulatory and administrative reforms to boost investors' confidence. Some of the issues raised by foreign investors include protectionist tariffs, retroactive tax regime, non-tariff barriers such as certification and licensing procedures, procedural irritants on the Ease of Doing Business index, and difficult labor rules. 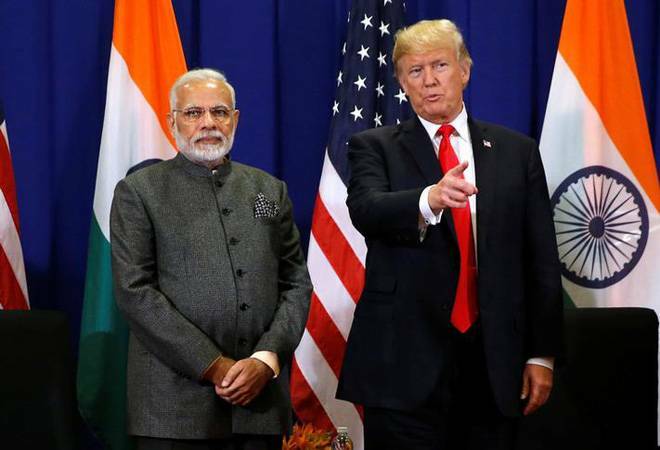 Resolving these issues will be a win-win for both U.S. investors, as well as India's bourgeoning manufacturing sector, and now is the time to take advantage of these opportunities. There's no hard evidence against Binny Bansal, so why did Walmart let him go?